There are many potential causes for a shaking or wobbling sound when driving a car. From the transmission to the tires, virtually any mechanism on your automobile that rotates or absorbs shock can be the wobble culprit. It is important to understand how to properly identify the cause of the wobbling sound. That way you can know whether the vehicle is safe to drive to the repair shop. Pinpointing exactly when your vehicle wobbles is a great way to narrow down the potential cause or causes. For example, if the vehicle wobbles when the brakes are applied, then there could very well be a problem with your rotors. If the vehicle wobbles inconsistently when you are traveling fast, like on a highway, you should have your suspension checked. However, a consistent wobble at higher speeds usually indicates that there is an issue with your tires. Another great way to identify the cause of your vehicle’s wobble sound is to listen for a certain location of the wobble. Often, the wobble sound can be isolated to a single wheel. Narrowing down the location will help the vehicle owner, or technician, to identify the cause of the wobble more accurately. For example, if the wobble sound seems to be emitting from the passenger side near the front, it is very likely that there is an issue with that specific tire, rotor, or suspension. However, if the vehicle seems to be shaking from every direction with no distinct location, a tire alignment may be all that is needed to stop the wobble. 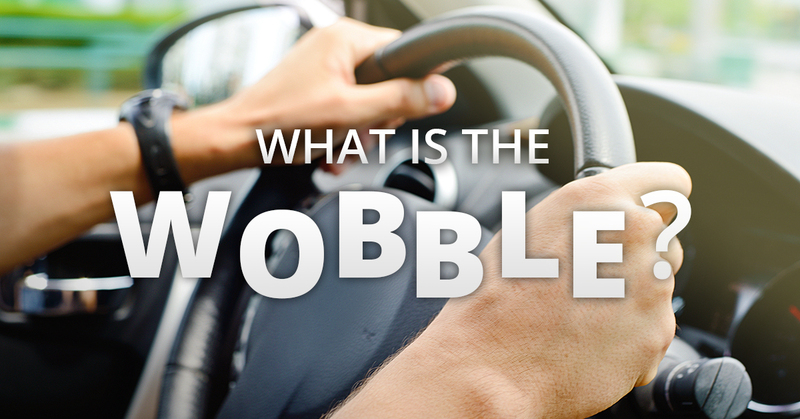 While most vehicle owners are familiar with the wobble sound that can indicate issues with their vehicles, they may not be able to pinpoint how the vehicle wobbles. Does the vehicle shake your whole car? Does it affect passengers in the back seat more than in the front? Does the vehicle wobble under certain conditions like towing or accelerating up a hill? For example, if a vehicle wobbles under heavy loads (i.e., towing, accelerating quickly, or going up a steep hill) there is a very good chance that your vehicle needs a new motor mount. If that is the case, then you know to take your vehicle to the shop right away.